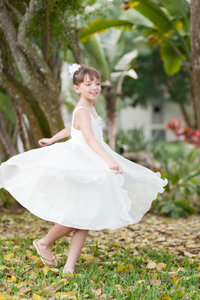 Written by Frank Simonetti and re-posted from the blog of Frank Simonetti Photography. 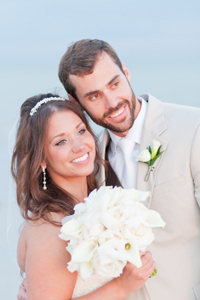 Laura and David had their intimate wedding on Sanibel Island June 23 at a secluded beach. 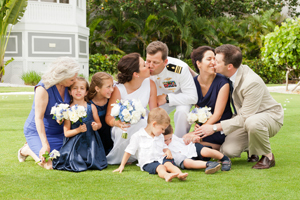 They were joined by their parents for this intimate destination wedding. 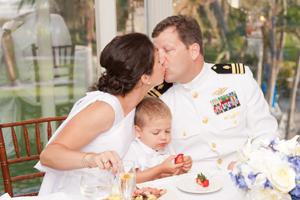 After the ceremony they returned to the Thistle Lodge on Sanibel for a celebration dinner. Thistle Lodge is an award winning restaurant that has been on Sanibel Island for many years. Thistle Lodge is a part of the Casa Ybel Resort. This is a great venue for a destination wedding. 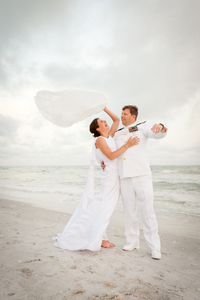 In my twenty years as a Sanibel photographer, I have photographed many weddings here. 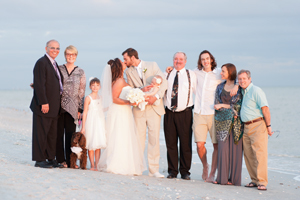 Some of the beach weddings are intimate with just a bride and groom and maybe some friends. The Thistle Lodge Restaurant can accomodate weddings of over one hundred guests. 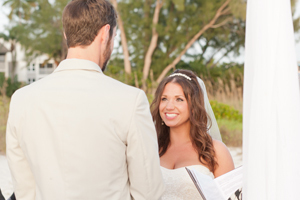 With a wedding ceremony on the beach, guests will just walk less than a minute to be in the restaurant. Thistle Lodge has amazing landscaping and unique, colorful Florida plants and trees. The wedding guests can stay at the resort interval time share units. 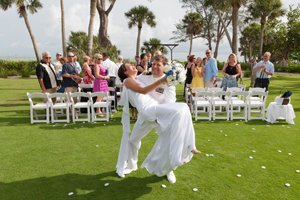 The wedding photography can start with pictures on the green lawn then a quick walk to the beach for the ceremony. After the ceremony we take some family photographs. 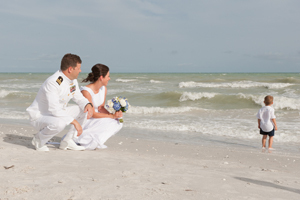 While we do this, the guests will usually walk the beach looking for seashells. As the whole world knows, Sanibel Island is famous for shelling! 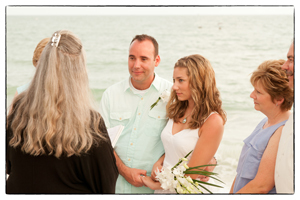 Patricia Slater, a Sanibel and Fort Myers area wedding officiant for over 30 years, performed the sunset ceremony. 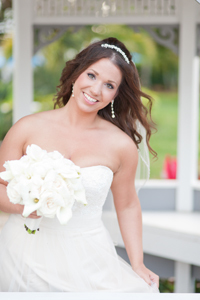 Patricia, a Sanibel Island resident, provided the flowers for this destination wedding. 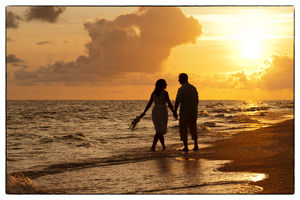 Patricia has been performing intimate wedding ceremonies on Sanibel Island and the Fort Myers area for over 30 years. 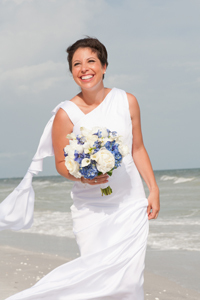 Her services include providing the marriage license, working with the bride for salon appointments, choosing the wedding flowers, recommending and reserving hotel rooms, wedding celebration dinner reservations and any other wedding details that can use the experience, knowledge and 42 years as a Sanibel Island resident. 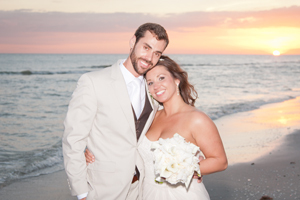 They arrived from PA with family and friends for their beach wedding on 1-5-15. 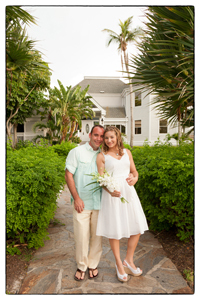 It was a late afternoon wedding at the Casa Ybel Resort. 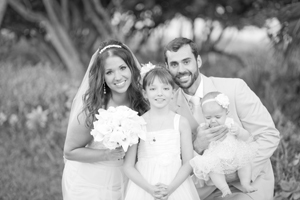 We started with photos of Kyle and his family. Kyle and Julie did not want to see each other before the ceremony, so Kyle went into the Thistle Lodge Restaurant to wait for the ceremony. 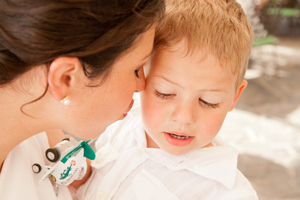 When Julie arrived with their two children, we created some additional images. Gianna was a joy to photograph with her Mom! 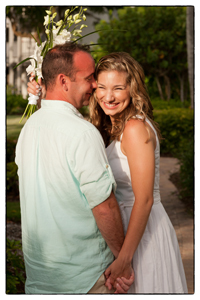 We wanted to start their Sanibel Island beach wedding on time, so off to the beach for a 4:30pm ceremony. 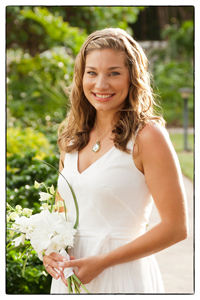 Patricia Slater of Weddings by the Sea was the officiate and wedding planner. 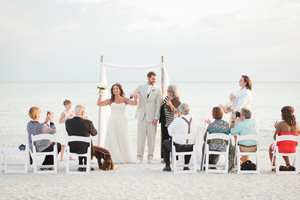 The guests gathered and found their seats on the beach-just 50 feet from the Gulf of Mexico. The day was warm with overcast skies. During the last hour of daylight the warm color of light came through the clouds which made for great photographs. Little Kinsley was carried to the ceremony by Kyle’s brother. So then Gianna walked down the aisle with the rings, followed by her Mom who was escorted by her Dad. 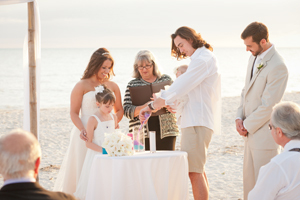 The beach wedding included a sand ceremony where the bridal family placed sand into a vase. The couple were pronounced ‘MARRIED’! 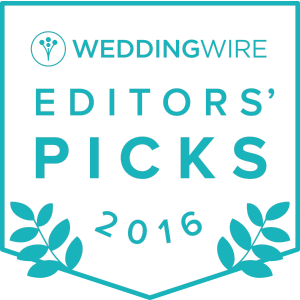 by Patricia Slater and walked back down the aisle. They hugged friends and family and we then took off for some green landscape photos. 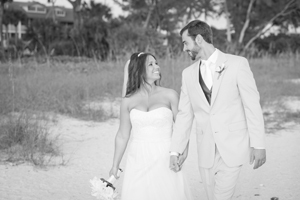 With the gray overcast, I enjoyed making a few of the photographs in black & white, the rich contrast was great for this Sanibel Island beach wedding. 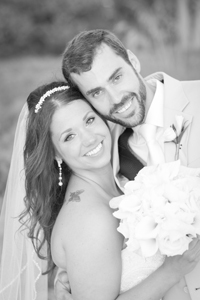 Julie and Kyle were fun to photograph with great energy and patience during their wedding photo session. After the sunset photographs, the couple walked to the Gazebo Room of the Thistle Lodge Restaurant where they enjoyed a celebration dinner and wedding cake with their friends and family. They were served by the great staff at Thistle Lodge Restaurant. 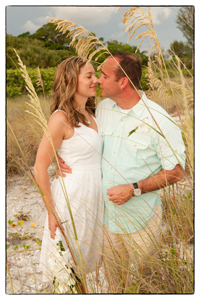 For over twenty years I have photographed intimate and destination weddings on Sanibel Island. 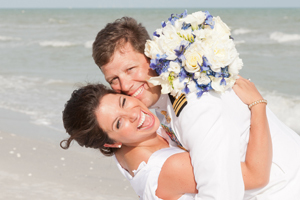 Shown here are some of my favorite photographs we captured at their Sanibel Island beach wedding. 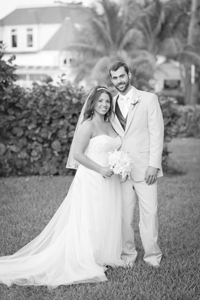 Katherine and Carl had their destination wedding at the Casa Ybel Resort on Sanibel Island. The weather was great with a strong breeze to cool the warm June sun. Family and friends gathered for the late afternoon wedding performed by Dr. Dan Lamey. The ceremony was on the lawn directly behind the Thistle Lodge Restaurant. The children had a great time and it was a photographers’ delight to capture them ‘on film’ . Will is the brides’ son and Sarah and Lauren are her nieces. Of course, the girls were very photogenic and with their wedding bouquets. So, Will had a fall while we were taking photos before the ceremony, someone had a colorful children’s band-aid for the invisible cut….oh another photo op as the bride kisses to make it better!. 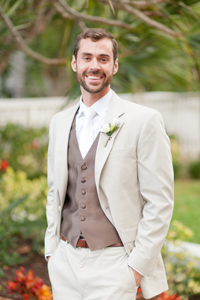 Meanwhile, the groom and guests were arriving to the ceremony site on the lawn directly behind the Thistle Lodge. The staff at Thistle Lodge had cold Lemonade and Tea for the guests as they gathered and waited for the bridal procession to begin. 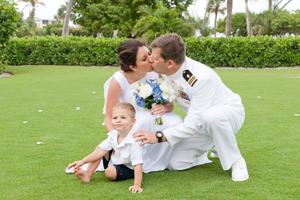 Then Nicholas the ring bearer strutted down to the ceremony with absolute confidence, another photo op! 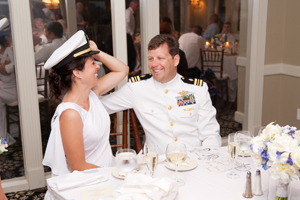 After the ceremony, the Lieutenant Commander quickly picked up his bride as they walked down the aisle. We then made a group photograph of everyone. The guests walked to the Thistle Lodge Patio for cocktails while we photographed the two families on a beautifully landscaped area at the Casa Ybel Resort. The wedding reception was upstairs in the Waterfront Dining room of the Thistle Lodge. After the dinner, we went for beach photos at sunset and tried to release some lanterns into the Gulf of Mexico….the wind did not cooperate but again….it was a great photo opportunity! Thistle Lodge is the restaurant located in the Casa Ybel Resort. Wedding music and dancing was provided by Steve Farst. Shown here are some of my favorite photographs we created.